For a period of 80 years, the U.S. government forcibly placed Native American children in boarding schools designed to eliminate their Native American identities and assimilate them with U.S. culture. 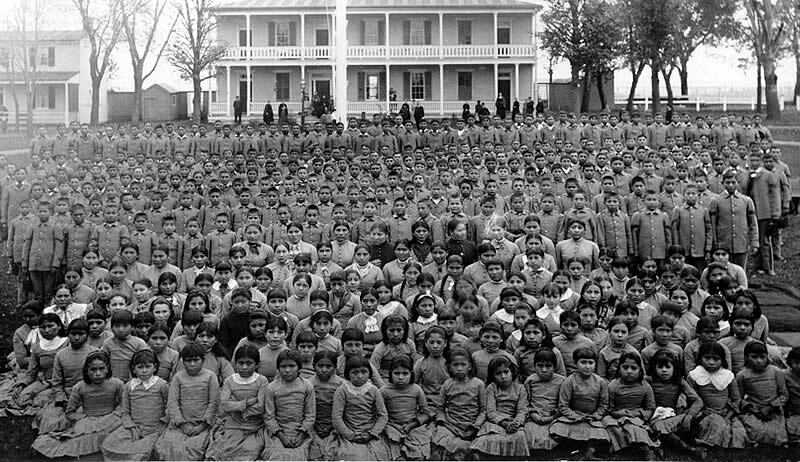 Run by the U.S. military and Christian missionaries, these boarding schools removed children from their families and prohibited Native American children from practicing their traditions. The schools were known for extreme discipline, cruel treatment, and exploitative labor. Individualism, private property, the nuclear family, and Christianity were ideals and values taught to replace traditional belief systems. While families were at first forced to send their children to these schools, they eventually became the only educational option in many Native American communities. Despite the systemic violence, many people continued to find ways to practice their traditions and maintain their identities. By forcing youth from many different First Nations into the same spaces, the boarding schools had the unforeseen effect of creating a shared identity and experience that facilitated the American Indian Movement of the 1960s (see also:Racial Justice Movements redefine citizenship,1960).While the majority of the boarding schools were closed in the 1940s, many stayed open through the second half of the twentieth century. A few remain open today, but with new goals and purposes. A photograph of pupils at the Carlisle Indian Industrial School in Pennsylvania, c. 1900.